Stretch marks are often a common cosmetic problem faced woman after their pregnancy. They can also develop in both women and men during puberty and when sudden changes occur in the body. Commonly they develop on belly, thighs, lower back, legs, buttocks and breasts. Usually, when dermal layers get stretched it damages the skin tissues and elasticity. This results in the development of stretch marks. Many people choose laser treatments to remove the stretch marks but it can cause harmful effects in long term. Don’t worry, just like other stretch marks, home remedies can also help to reduce the appearance of stretch marks. In this article we will tell you about castor oil for stretch marks. Is Castor Oil Good for Removing Stretch Marks? Castor Oil contains natural fatty acids which moisturize the skin. It locks the moisture in skin cells to hydrate the skin. It can effectively penetrate into the deep layers of the skin and promote skin health. It encourages the production of collagen and elastin which helps the skin stay firm and supple. It contains antibacterial and antiseptic properties which fight with the any bacteria present in the stretch marks. The ricinoleic acid present in it deals with the infection and inflammation. 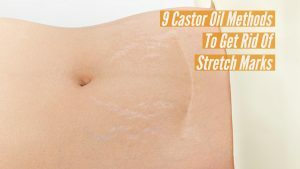 How to Use Castor Oil for Stretch Marks? Below we have listed remedies with castor oil. Choose one of the method and try it regularly to reduce the appearance of stretch marks. Massage lukewarm castor oil on stretch marks for 5 minutes. Let it rest for 15 minutes and rinse off with water. Alternatively, you can use Jamaican castor oil. Blend and extract juice from 1 potato. Mix potato juice and 2 tablespoons castor oil. Apply to the mixture on stretch marks and leave it for 20 minutes. Coconut oil increases the level of moisture in the skin. Mix equal amounts of castor oil and coconut oil. Grind few cloves to a fine powder. Mix them in enough amounts of castor oil. Heat the mixture until lukewarm. Gently massage them mixture on stretch marks for 15 minutes. Wrap a cloth around the area and leave it for 30 minutes. Aloe vera effectively seeps in to the deep layer of the skin and repairs the epidermis. Extract aloe vera gel from an aloe vera leaf and mash in to a juice consistency. Add castor oil and heat the mixture until lukewarm. Apply on the stretch marks and leave it for 20 minutes. Combine 1 tablespoon castor oil and 2 tablespoons almond oil. Leave it for 20 minutes and wipe off with a damp cloth. Mix 1/2 part castor oil, 1 part jojoba oil and few drops of tea tree oil. Warm the mixture in microwave. Gently massage the mixture on the stretch marks for few minutes. Oatmeal removes the damaged and dead cells from the skin. Mix 1 tablespoon castor oil, 1 teaspoon uncooked oatmeal and 2 tablespoons olive oil. Rub the mixture on stretch marks for 5 minutes. Combine equal amounts of castor oil and sugar. Scrub the mixture on stretch marks for 5 minutes. Leave it for 15 minutes and rinse off with water. On application of castor oil, if you experience redness, burning, or any other discomfort then avoid castor oil. Don’t use castor oil application if you have cuts, wounds and blisters. Use cold compressed or minimally refined castor oil for more effective results. Repeat the remedies regularly to reduce the appearance of the stretch marks. Be gentle while exfoliating as harshness can damage the skin. Include fresh veggies and fruits in your daily diet improve skin health and immune system. Take omega-3 supplements to improve the health of skin membrane. It is important to repeat the remedies regularly without fail. We hope this article was helpful. You can write to us in the comments section below. If I use castor oil and coconut oil pack o stretch marks do I have to heat the oil?